Even though, thanks to some family business that needed my attention, I've been on the road more than Charles Kuralt over the past few days, I knew exactly what I was going to write about this week. In fact, I was so pumped about the content I had planned that I even tried jotting down some preliminary thoughts as I was traveling — a venture I quickly abandoned in wake of the blazing headlights and blaring horns from other drivers unaccustomed to a Westbound vehicle in an Eastbound lane. I tried calling you a couple times, but I understand you are probably in the midst of your own crisis. Well, I have bad news... Dennis passed away. 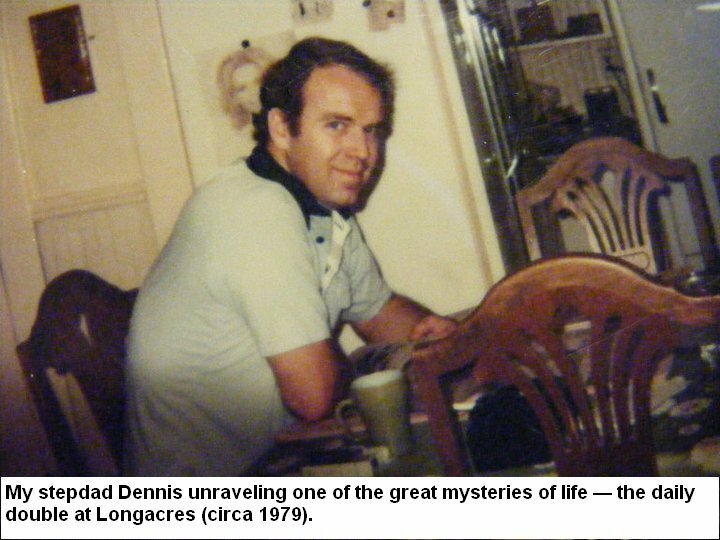 Dennis is — or was, I guess — my stepdad, the last person my mother ever spoke to in the final days of her (losing) battle with cancer and the first person that ever took me to the races. “Who wants to watch horses run around in a circle all day?” I remember asking him, with a naivete so complete it's not difficult to understand why, for years, I thought that an STD was some sort of pro basketball stat (now, of course, thanks to former NBA stars Shawn Kemp and Calvin Murphy I know for certain that it is... or should be). “It'll be fun,” Dennis assured me. And he was right. The Sport of Kings became the love of my life and Dennis and I became handicapping buddies, as well as regular patrons at Longacres Racecourse. During my high school years, the smell of coffee brewing on a weekend morn was invariably accompanied by Dennis and I marking up a perfectly good Daily Racing Form. “You done with the fifth race?” I would ask. “Yeah, you got the last part of the ninth?” He would answer. As I grew older, the races continued to be a common interest and our greatest bond. 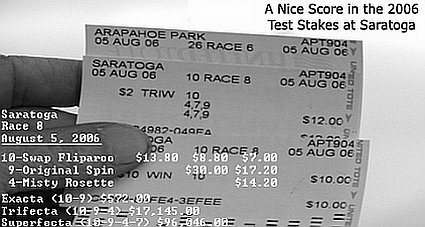 About a year after my mom died, Dennis cashed the biggest ticket of his life in the Test Stakes at Saratoga on some horses I suggested he play. Dennis' $22 ticket returned $17,214. I made approximately $17,096 less that day, yet couldn't have been any happier. Of course, like everybody else, Dennis had his faults — he sometimes drank too much and a few years ago he kind of dropped out of sight. One day, I learned from my sister that he had packed up and moved back to Montana, where he was born, to be with his immediate family. Apart from one phone call (that I initiated), I never heard from him again. But something tells me we'll see each other once more. On the backside of the most beautiful racetrack you've ever seen — Longacres, Del Mar, Saratoga and Longchamp all rolled into one — he'll be swapping stories with Eddie Arcaro and Bill Shoemaker. I'll ask him if I'm in heaven. He'll say yes... and hand me part of his Form. Click HERE for Saturday's selections. Dennis sounds like a good guy. Sorry for your loss, Derek. Couldn't have said it better myself Derek. It's all true, Dennis wan a great person, brother-in-law and friend. I will miss him and his sense of humor. As he always called me with a smile on his face.